They come across like a reliable band for a support slot rather than an act ready to set the world alight as headliners. 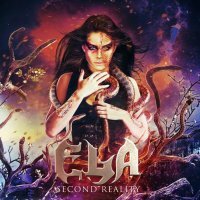 It's meaty Power/Heavy Metal from ELA, and their German origin should come as no surprise given they have that distinctive Germanic muscle. Led by Michaela "Ela" Eichhorn, she's their bid to separate themselves from the hordes who are also peddling Power Metal. It's refreshing to hear a Female-Fronted Metal band who haven't completely jumped on the Symphonic bandwagon. She's a decent shouter, much like the boys in the genre, only higher-pitched. There are some spoken parts too, on songs like 'Witch Of Salem', 'House Of Lords' and 'Varus', where she sounds unblinkingly demented, which fits well with the music and lyrics. Those lyrics cover everything you might find on a fourteen year old boy's bookshelf, assuming he was into fantasy and the macabre. It works well on 'Alchemy', 'Lizzy Borden's Rhyme' and 'Deadly Sins' which mix the big riffs with Bierkeller sing-along choruses. 'Black Roses' shows a completely different side to the band, a sensitive ballad that has a cinematic and epic ambition about it. Occasionally, as on 'Psycho Path', the solos stand out, adding more appeal to the material. However, at times, I can't help feeling that ELA risk falling between two stools. They are heavy, but in a slightly old-fashioned way and not in the modern, jaw-juddering, aggressive fashion, and, while they have melody, many bands have more. This is not bad though, and it has appeal for traditional Metal fans, but on the strength of this album, they come across like a reliable band for a support slot rather than an act ready to set the world alight as headliners.